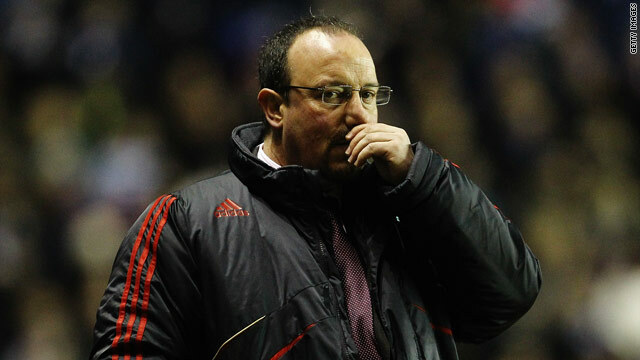 Liverpool manager Rafael Benitez was left to rue another frustrating performance from his team. (CNN) -- Liverpool's erratic season continued as last season's Premier League runners-up were held to a 1-1 draw by struggling second-tier side Reading in the English FA Cup on Saturday. Rafael Benitez's team had boosted their hopes of qualifying for the Champions League with two wins after the shock defeat by bottom club Portsmouth, but now face a home third-round replay after having to come from behind to avoid an embarrassing early exit. Benitez fielded a strong side after saying before the match that the knockout tournament represented Liverpool's best chance of winning a trophy this season, but saw the managerless home side take the lead in the 24th minute. Young striker Simon Church bundled the ball over the line from close range after Poland international Grzegorz Raziak hooked Ryan Bertrand's free-kick back across the face of the goal. Reading, who sacked manager Brendan Rodgers last month after a run of poor results left the former Premier League club hovering around the relegation zone, did not retain the lead for very long. Liverpool captain Steven Gerrard provided the equalizer 12 minutes later when his fierce whipped effort, which appeared to be aimed at Dirk Kuyt, bounced into the net as the Dutch striker's presence seemed to disorient goalkeeper Adam Federici. Fernando Torres had a chance to score a late winner for Liverpool but the Spain striker headed onto the roof of the net with Ben Hamer, who replaced the injured Federici, stranded off his line. Two other top-flight teams were denied wins by lower-league opposition. Portsmouth were held 1-1 at home by second-tier side Coventry so must travel to the Midlands for a replay. Avram Grant's cash-strapped side, who were again not paid their wages in time before the match, trailed to David Bell's goal and needed an equalizer in first-half stoppage time from German midfielder Kevin-Prince Boateng. In-form Birmingham escaped with a 0-0 draw at Nottingham Forest, as the home fans saw Luke Chambers head against the crossbar and Robert Earnshaw miss a penalty. Manchester City gave new manager Roberto Mancini a third successive victory, with striker Benjani Mwaruwari scoring the only goal at second-tier Middlesbrough. Mancini made several changes ahead of Wednesday's League Cup semifinal against Manchester United, but saw defender Micah Richards join Brazilian forward Robinho on the injury list. Benjani, making a rare start with Emmanuel Adebayor at the African Nations Cup and Carlos Tevez and Craig Bellamy on the bench, netted on the stroke of halftime after being set up by Bulgaria winger Martin Petrov. Tottenham crushed struggling second division side Peterborough 4-0 as Croatia midfielder Niko Kranjcar scored the first two goals before strikers Jermain Defoe and Robbie Keane added the others in the final 20 minutes. Aston Villa crushed 10-man Blackburn 3-1 as El Hadji Diouf was sent off for a professional foul, with Nathan Delfouneso, Carlos Cuellar and John Carew scoring while David Dunn missed a penalty for Rovers. Two goals from second-half substitute Charles N'Zogbia gave Wigan a 4-1 victory at home to Hull in the only other all-Premier League encounter. Everton needed late goals from Australia midfielder Tim Cahill and defender Leighton Baines, from the penalty spot, to earn a 3-1 win at third division Carlisle. Burnley beat third-tier MK Dons 2-1, managerless Bolton romped to a 4-0 victory against fourth division strugglers Lincoln and Sunderland cruised to a 3-0 win over non-league Barrow. On Sunday, cup holders Chelsea host second division Watford, Manchester United are at home to third-tier Leeds and Arsenal travel to struggling London rivals West Ham.